On 6 April 2016, the Government introduced a Personal Savings Allowance, which is the amount of interest you can earn on your savings without paying tax. This applies to individuals only, as businesses, charities and clubs, already receive interest without tax. The tax-free allowance on savings is £1,000 for basic rate taxpayers and £500 for higher rate taxpayers. There is no allowance for additional rate taxpayers. As a result, tax is no longer deducted from the interest paid on your savings accounts, investments and current accounts. If you are a basic rate tax payer, earn £20,000 a year and receive £250 in savings interest, you won’t pay tax on this interest because it is within your £1,000 Personal Savings Allowance. If however you receive £1,500 in savings interest, you will only pay tax on £500 of interest, which is the amount above your Personal Savings Allowance of £1,000. If you are a higher rate tax payer, earn £60,000 a year and receive £250 in savings interest, you won’t pay any tax on your interest because it is within your £500 Personal Savings Allowance. 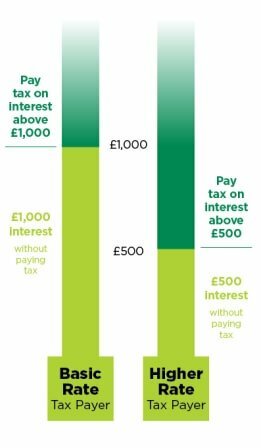 If however you receive £1,100 in savings interest, you will only pay tax on £600 of interest, which is the amount above your Personal Savings Allowance of £500. Where you have savings income below the new Personal Savings Allowance or your total taxable income is less than £17,000 (for example, from wages, profits, pensions and savings), you will have no tax to pay on savings interest. Where you have a joint account with someone, you will both have a Personal Savings Allowance and the tax-free interest payable will be combined. ISA income is already tax free and so does not count towards your Personal Savings Allowance. If you previously completed a form to receive interest tax-free (HMRC calls these forms an R85 or R105), you no longer need to do this. If you have savings above the Personal Savings Allowance, tax will be collected automatically by HMRC, through a change to your tax code. If you already fill in a self-assessment tax return, you should carry on doing this and include any income from savings on your return. It is your responsibility to make sure any tax you owe is paid directly to HMRC. Until 5 April 2016, your interest was paid net of basic rate tax, unless your account was an ISA account or if you previously registered to receive interest paid gross. Now, tax is no longer deducted from the interest paid on your savings and current accounts, and your interest is paid gross. If you need more detailed information on how the new Personal Savings Allowance affects you click here to read the Government factsheet.